That’d be me (Rachel). As it was said in our after party, FtP divvies out tracking responsibilities to the players. 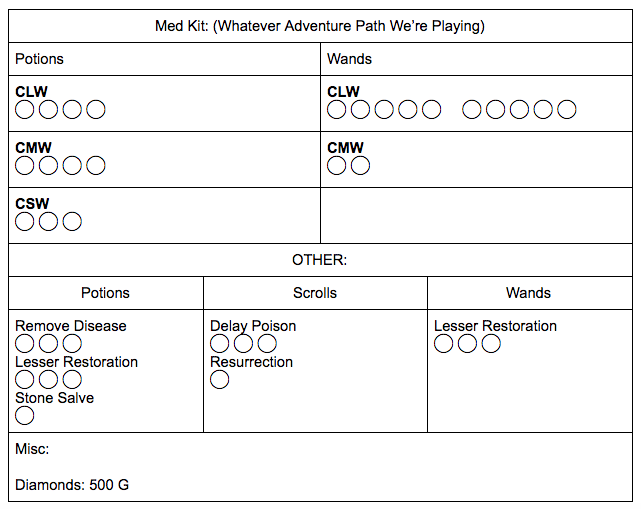 Originally I took on the task of Time Keeper, but for the past few Adventure Paths I’ve been the resident Med Kit Tracker. I keep it pretty simple, but there are a few things to keep in mind. When players think medicinal, they usually think of healing potions or wands, maybe restorations, and possibly a raise dead (once your party is making all that adventuring gold). That is definitely a good start, but the more we play, and the more crazy situations we’ve dealt with, our Med Kit’s contents have expanded a bit. It’s important to note that none of the items in the med kit count against the party treasure. No one has to pay the med kit back for what they use. It’s a communal resource. Also, the healer doesn’t have to be the one that carries it. Usually, it’s a good idea to have someone who isn’t the healer keep track of it so that if the healer goes down (or gets turned to stone), the med kit is still easily available (not stone) to get them back up (trust me about the stone thing). Primary healing I keep at the top. At low level, we might have a few potions and maybe a wand if we’re lucky. I check them off as we use them. For wands, I create a new row for each separate wand to keep track of the charges. As we get to higher level play, this becomes more of an emergency stash; what we use if we need to continue fighting in a dungeon and the casters need to use their healing/spells during battle. My lower section tends to be the extras. These change based on whatever game we’re playing. Without giving away spoilers, you may have a game that contracting diseases becomes an issue, so we stock up on potions or scrolls that help out with that. Buff spells also get lumped into this section. We might find a bunch of Cat’s Grace positions, or in the example above a Stone Salve. This definitely comes in handy when player’s have taken a hit to their stats. Last but not least, I leave a little gap at the bottom to keep track of the miscellaneous things that pop up that don’t fit into the other categories. In one of our games, I started keeping a tally of diamonds and diamond dust. In another, I keep a cache of wolfsbane. So, the Med Kit does have the typical cures, but it needs to bolster your party as well. There’s nothing like slogging through a particularly nasty dungeon and having an empty Med Kit. Hope this gives a little insight to how we do things. Feel free to submit any questions if you have them!